This is the second giant-scale Hummer we've tested, the first being the Fast Lane model. Well, right out of the box, it looks like this battle of the big guns is going to be a tough one. The New Bright has great detailing including moveable real side mirrors and chrome wheels with off-road ready tread. It also has working lights all around. The controller gives hints to some other cool features in this H3, starting with sound effects. A Lock/Unlock button acts as a remote engine start/immobilizer switch to turn the truck on & off. There's also a remotely-activated horn. Applying throttle makes realistic engine revving sounds, as does switching between the three available speeds. Best of all, the sounds come out of the truck itself, not the controller. Everything you need to drive is included in the box, including a full rechargable battery setup, so all you have to do is charge up & go. 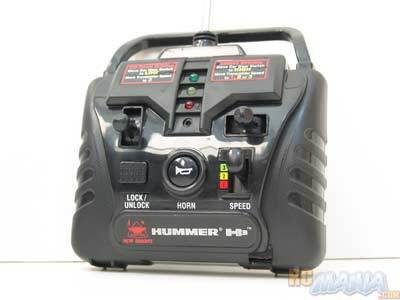 It's worth noting, though, that the battery is a New Bright exclusive design, not interchangable with standard 9.6V batteries, so if you have extras from a Nikko, Tyco, or Fast Lane, you won't be able to use them with this truck. On the street, the New Bright Hummer H3 goes a pretty decent speed, the same as the Nissan 350Z from the same company. That's fast enough to pull some short e-brake turns by tapping reverse when you start to steer. Normal steering is responsive and feels right. To go off-road, you can change to a lower, more powerful gear in the truck's transmission by flipping a switch on the back of it. Then you move the speed selector on the controller to the fastest setting to get the most available torque. Over the rough stuff, the suspension works pretty well, but the motor bogs down easily and can get stuck. You also get stuck if you get into a situation where one rear tire lifts off the ground, because the rear differential is tuned for street driving and gives more power to the wheel with less weight on it, exactly the opposite of what you want on dirt & rocks. 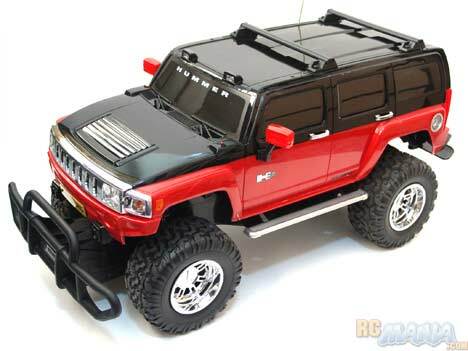 The New Bright Hummer H3 1/6th scale looks great and on pavement or level ground, it's very fun to drive. Younger kids in its age range in particular will enjoy it, especially because of its size and realistic sounds. If you want a rough & tumble truck to go offroading with, though, this isn't the truck for you. On minor inclines and over modest bumps, it can easily get stuck and the motor really isn't powerful enough to propel it around at good speed.